Massive blue whales perform 360° rolls in order to take in the largest possible volume of krill according to research published in Biology Letters today. Whales also roll over when searching for krill, enabling them to identify where their prey are most densely collected. 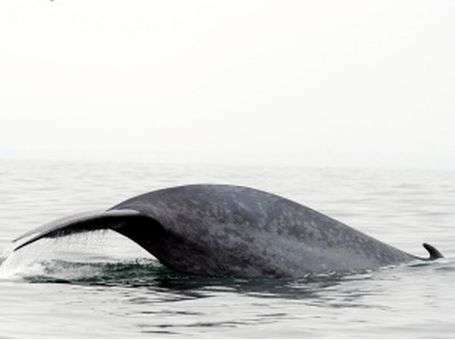 Researchers from Cascadia Research Collective in Washington studied the foraging behaviour of blue whales feeding on krill using multi-sensor tags. Their analyses revealed the whales performing 360° rolling manoeuvres while lunge-feeding. Their video data show the animals targeting an isolated patch of krill, which suggests that these behaviours play an important role in repositioning the jaws to engulf the densest proportion of the available prey. The extreme body size of blue whales requires a high energy intake and therefore demands efficient foraging strategies. Blue whales engulf a large volume of prey-laden water in a single, rapid gulp. The efficiency of this feeding mechanism is strongly dependent on the amount of prey that can be captured during each 'lunge', yet food resources tend to be patchily distributed in both space and time. Scientists suggest that this rolling behaviour is aimed at anticipating the prey's escape trajectory, such that the jaws are repositioned to where krill will be at the time of mouth opening, and thus maximizes prey capture. Within this context, and given the fact that only 10 per cent of lunges in this study involved a 360° roll, this behaviour may represent a honed strategy that is specific for a certain prey patch shape or size. The researchers also recorded rolling behaviours when whales were in a searching mode in between lunges. This suggests that this behaviour also enables the whale to visually process the prey field and maximize foraging efficiency by surveying for the densest prey aggregations. These results reveal the complex manoeuvrability that is required for large whales to exploit prey patches and highlight the need to fully understand the three-dimensional interactions between predator and prey in the natural environment. Might also want to check if such a huge beast rotating at appreciable speeds does not create a vortex which actively prevents krill from escaping (and/or is actively funneling more of it into the whale's maw).